Advancement in the Boy Scouts is different from advancement in the Cub Scouts. The older boys are expected to work harder for their awards, and they generally do not advance as quickly. We are frequently asked about advancement, so allow us to answer some of your questions in this letter. Below are eleven items that I would like for you to read. If you find my explanations too long, you can read the bold faced type and the underlined text for the condensed version. 1. No one has the right to change any requirement to any badge or rank. Requirements cannot be added, they cannot be deleted, and they cannot be substituted. This simple and absolute rule is repeated many times in the scout literature. 2. Who can sign for a completed requirement? For rank advancement, any adult leader can sign (initial) a scout's handbook. Traditionally in Troop 165, parents have refrained from signing their son's book. You can work with scouts and sign their books on knot tieing, however, I try to get the Scoutmaster to work with and sign your son's book on knot tieing. There are many good reasons for this: objectivity, learning to work with other adults, learning different perspectives, getting to know leaders, initiative, self-motivation, overcoming shyness--to name a few. Merit badge requirements must be signed by a Merit Badge Counselor (MBC). Individual requirements must be signed an MBC. "Partials" must be completed by an MBC. This rule for MBCs is quite absolute. For instance, even though you might be a CPA in a big-eight firm, you cannot sign-off any of the requirements to the accounting merit badge, unless you are a listed MBC. There is a list of MBCs in the barn. 3. When to sign? Sign or initial the advancement after you saw the scout complete the requirements. The scout may say that he just identified ten trees with Mr. Smith and Mr. Smith has left, will you sign his book. Your response should be that Mr. Smith will sign the book. If the scout does not want to wait, he can identify ten trees with you and then have you sign the book. This might cause a scout to repeat requirements before his book is signed. Since the reqirements are actually skills that are used over-and-over in scouting, camping, and life, it is good that the scouts repeat the skills a few times under observation. Parents: DO NOT TAKE YOUR SON'S BOOK UP TO A LEADER AND ASK HIM OR HER TO SIGN A REQUIREMENT. It is your son's book, it is your son's advancement, and your son is the scout. He should be working on the advancement. In general, a scout doing a requirement for the parent is not sufficient (Family Life merit badge is a notable exception to this rule). If the boy has to swim 100 yards, let the boy ask an adult leader to meet him at the pool to see him swim the 100 yards before expecting to have the requirement signed off. This means that requirements for scouts cannot be passed when a boy is a Webelos scout. Cooking for your patrol, for instance, must be done as a Boy Scout. Even though your son might have cooked for his Webelos den, that does not satisfy the scout requirement. 4. What is the Scoutmaster Conference about? This is the Scoutmaster's time to talk with your son. It is not appropriate nor desirable that I should suggest what the Scoutmaster talks about during this conference. The scout literature says it is appropriate for the Scoutmaster to "test" the boys. He could ask how do you find north at night. He could say that he did not see your son go through the orienteering course, even though Mrs. Jones initialed this requirement as complete. So, he can ask the boy to do the orienteering course again. 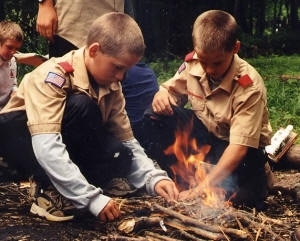 It is also appropriate for the Scoutmaster to ask the boy about his experience in scouting, and it is a time to form a tighter relationship between the scout and the Scoutmaster. In short, the Scoutmaster conference can be anything from a 5 minute conversation to working together over the next three months so the scout is performing at a level that the Scoutmaster expects. 5. What is the Board of Review? This is a group of at least three leaders. These leaders must be approved by the Board of Review Chairman. The Board of Review does not test the scout about his scout skills. The Board of Review looks at the Scout, the advancement, the maturity and application of the scouting principles to life. They can, and should, ask the boy to recite the scout oath, the scout law, the motto, the slogan, and the outdoor code. They can also ask the scout to tie a square knot. However, the important question is: How have you used the square knot during a camp-out? Scout skills relate to scouting, camping and life. It is important that the scout see and experience this connection. The board of review determines if the scout has made this connection. So, they might ask how many meetings have you attended since you passed Tenderfoot? How many patrol activities did you organize while a patrol leader? The Board of Review does not "fail" scouts. The Board of Review points out places that need attention or work and then suggests a date that the boy and Board of Review should meet again. 6. How fast should a scout advance? This is a very hard question to answer. In general, they should work at a pace that they set. Scouting is physical, mental, and emotional. A scout may lag in advancement because he is not comfortable in camping when his dad doesn't go. He probably needs some time to mature a bit. A scout must be able to solve simple algebra problems to get the electricity merit badge. A typical sixth-grade math student is usually bewildered by the combination of Ohm's law and the power law. This scout needs to advance in school before attempting the merit badge. A scout might know his knots and lashing, but he might not have the strength to pull the ropes to lash together the monkey-bridge. This scout needs another year of growth to see just how far his scout skill and his body and mind can take him. Most 10 to 11 year-old boys take a year to get to First Class. I could imagine that a 14 year-old boy joining the troop might make First Class in six months. The maturation from age 10 to 14 is tremendous. In any event, scouting does not offer "quick rewards." The process is one of growing, learning and maturing. For a new scout joining the troop, the Eagle Award is probably 5 or more years away. Scouting is designed to grow with the scout. This is very different from the activity pins that the boy quickly earned as a Webelos scout. Parents and boys have to adjust their thinking about advancement when moving from Cub Scouts to Boy Scouts. The requirements, the Scoutmaster conference and the Board of Review all help to set the pace of advancement. 7. What should I do if my son's advancement is too slow? I have had two sons explain to me (like I do not understand scouting) that scouting is part "fun" and part "advancement." They do not want the advancement portion of the program to rob them of the fun part. You know, they are right, so I have let my boys have fun in scouting. They are both active in scouts and enjoy the program. I know a bright and well-behaved boy who has been First Class Scout for two years. He now lacks one "Eagle-required" merit badge to advance in rank. I point out to him that most of his friends are Star or Life Scouts. I ask him if there are problems that prevent him from advancing. I nudge him in the correct direction as he emotionally matures and realizes the importance of working on his advancement. I would love for all our scouts to make Eagle rank. Unfortunately, they won't. The Scoutmaster nudges and guides the boys with a skill that is nothing short of impressive. Some of the boys just don't get it all together until it is too late (the 18 year-old deadline is a very hard limit). In addition, there are interests that sometime conflict with Scouting, and boys sometime choose the other activities. These other activities are important. Yet, I wish these boys could share some of their time with scouting. Unfortunately, that is not always possible. We have to recognize and we have to accept that not all boys are the same. They have different interests and priorities. 8. Is something wrong if my son is not advancing--even though he is trying? It is important that your son enjoys scouting. If they are having trouble advancing, you need to determine if they are having fun in scouting. If they are frustrated or bored, be careful, because they are ready to quit scouting. If they are having fun, encourage them to keep trying. It is not uncommon for a scout to have 3 or so partial merit badges that he never completes. I have almost never seen a boy complete a partial merit badge without the parent or merit badge counselor standing next to them and telling them to complete it. Their brains do not register this partial merit badge as one of the simplest to complete, and as a waste of time if they don't complete it. They always feel they have plenty of time to finish the badge. It is important for the parent to remember that the scout has to mature emotionally, physically and mentally to advance. You have to objectively consider where your son stands. Consider your son with those big high school scouts with the deep voices talking about fixing their cars at the back of the barn. Does your son just need some time to grow? 9. A son is first-class, 16 years-old and enjoys scouts, but the parents are afraid he will never make Eagle. There are many carrot-and-stick approaches to this problem. We, personally, do not think that any of them works well. The rank of Eagle comes from personal motivation and personal drive. You can influence, nudge, and suggest. Ultimately, the carrots and sticks must be internal, not external. What can you do? You can ask if there are any problems that are not allowing your son to advance. You can then help your son make a list of goals or steps towards advancement. Think about what is required for each step and then budget a time to complete each step. There are many books on personal motivation. Many of the books suggest a detailed list of things-to-do. As things get done, they get scratched off the list. Having many items to scratch off the list provides positive, internal drive to work down the list. There are other ideas and methods. You have to find what works with your son. 10. What can I do if my son is not treated fairly with his advancement? Talk to the Scoutmaster or to the committee chair. See the Scoutmaster at the Fire station, call the Scoutmaster at home, or call at work. Do not confront the Board of Review and try to tell them that they were wrong. Do not confront the MBC and tell them that they are doing their job wrong. We are all volunteers. We are all working for the same goal. We all make mistakes, and so does your son. We will try to get all sides to the story and speak objectively on the issue. Most of the problems are mis-understandings. Let's not get hot under the collar about a mis-understanding. If there is a wrong, we will attempt to correct it. 11. Respect the adult volunteers. Please respect the time and efforts that many people contribute to the troop. This means that you should try to get your son to activities on time. You should pick them up at the end of the activity. Don't make the adult wait for 30 or 45 minutes for you to come and pick up your son. If the adult places a maximum size on the class or a minimum age, do not plead to make the rules apply to everyone else, but not to your son. The adult leader probably has good reasons that he made the restrictions. Offer to help if you have the time. If there is something that the adult is doing or not doing that bothers you, talk to Mr. DeMello or to a adult leader. We can all learn and improve. Let's do it respectfully. If you do not have time to read through all of this, read the highlighted sections and the underlined phrases. I hope that this helps you to understand scouting and rank advancement. I hope it helps all of us to get more boys earning the Eagle rank and helping all scouts be better and stronger in their scouting skills. Please let us know if you have any questions, concerns or comments.